Every restaurant has those off-peak times when seats are hard to fill. If you’re a restaurant owner, you’ve probably tried a variety of ways to increase the number of customers during these hours. Of course, it’s not as simple as introducing a new menu. Increasing sales during slow times can be one of the most challenging tasks for a restaurant. Often, you have to grab customers’ attention at just the right time and tempt them with a mid-afternoon appetizer, a late-evening nightcap, or a Tuesday all-you-can eat meal. This means implementing some creative real-time marketing efforts. Real-time marketing uses information and data of new or existing customers, including personal trends and spending history, to send targeted instant offers that will get them in the door and encourage them to purchase more. Your fans and followers are already engaging with each other in real-time. They’re sharing content via Facebook posts, comments, tweets, and more. So, social media is an obvious source of real-time marketing for your restaurant. This can be as simple as sharing a photo of your dessert feature on your Facebook page along with a discount for anyone who mentions the post after 9:00 p.m. Or, you could let customers know via Twitter that you’re giving a donation to a local charity for anyone who buys an appetizer between 2:00 and 5:00 pm. Not only do these real-time promotions encourage more diners during slow hours, they increase exposure of your brand to their followers who may happen to see your content, as well. Online advertising is an important component of any comprehensive restaurant marketing plan, and it’s one of the best ways to increase sales during slow times. Google AdWords is one of the easiest tools to launch an online marketing campaign based on the words your customers are searching for when they’re looking for a restaurant. For example, if you have a sushi bar in San Francisco, you can create an AdWords campaign based on the term San Francisco sushi. When an individual searches on Google for this term, you can have specific ads, texts, and banners appear that encourage readers to visit your site or to download a specific promotion. This could be a deal to promote a happy hour pricing menu for your slowest period of the day or an early bird discount from 4:00 to 6:00 p.m.
You probably already check your Yelp reviews on a regular basis. Yet, you may not have thought of the crowd-sourced review site as a tool for marketing your restaurant during slow hours. Yelp Deals lets you create incentives that are featured on your Yelp listing. Consider creating a $25 for $50 voucher for food and drink to give customers a valuable incentive to come in during an off-peak time. You can amplify this by promoting a Yelp Check-In offer that gives an additional bonus for customers who “check-in” to your restaurant via Yelp’s application. A good check-in offer would be a free dessert or appetizer for checking in during designated times. Do you have an extensive mailing list of existing customers? SMS or text message marketing gives you the ability to reach out to these individuals on a regular basis and to encourage them to come in for a meal or snack at a time other than during the dinner rush. You can instantly reach customers with brand-driven, well-timed text messages during off-peak hours or slow days with special offers and coupons. You can also promote new menu items, events, weekly specials, or even triggered messages with birthday or anniversary greetings. If your lunch hour is slow, give coupons for a free salad with the purchase of a lunchtime entrée to dinner guests. Promote a “professionals’ hour” discount after 10:00 p.m. that encourages individuals within the restaurant industry to enjoy a meal after their shift. Reward employees who bring friends and family during off-peak times. Partner with a local wine shop by providing coupons for “free corkage” for anyone who buys a bottle and brings it to your restaurant to drink with a meal. Place a sign in front of your restaurant encouraging those walking by to enjoy discount “mid-day munchies” to attract diners in-between lunch and dinner. 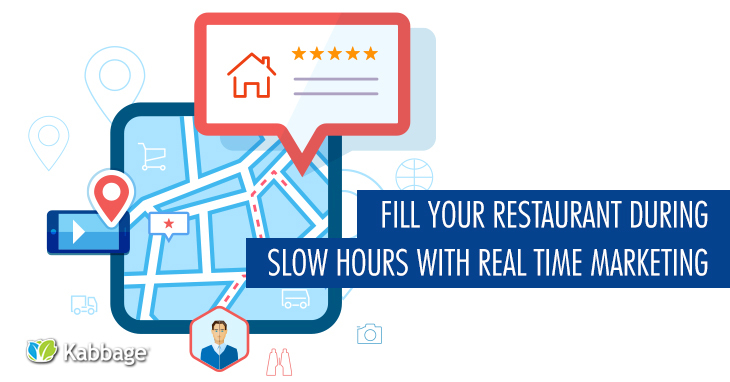 With creative real-time marketing, you can quickly turn slow times into go times for your restaurant. Be creative and try a variety of tools and strategies to achieve the greatest success. Hey, you might even become the new neighborhood favorite place for happy hour or after-hours dining! Do you have a real-time marketing tip for fellow restaurateurs? Share with us in the comment section below.